The pallet nhựa cũ giá rẻ in green though used but still ensure the quality of goods inventory. 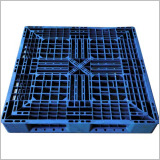 The product is made of HDPE plastic with high durability, which helps prolong the life of the pallet. - The old plastic pallet of Vina-Forklift has been used but still ensures 90-95% new. - Buy old pallet nhựa to help you save a large amount of investment costs.